Hazel Durbin was born in Derby, Oregon, in 1915. 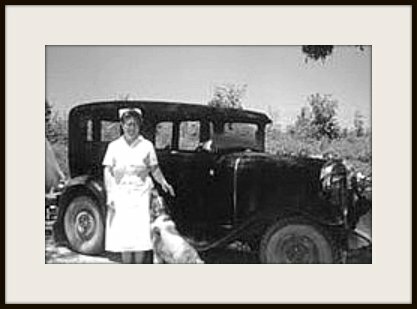 As a young woman, she had wanted to do rural ministry, and on graduating from the Bible Institute of Los Angeles in 1943 came to work in the Eastern Kentucky mountains. She lived first on Stray Branch in Breathitt County, and then in Lee County until her death in 2002. 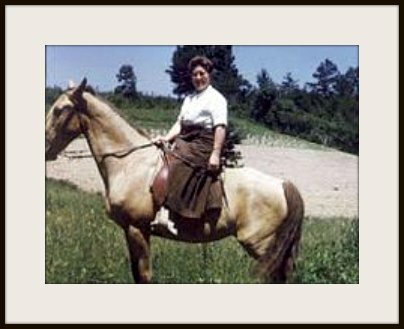 Her work included teaching, midwifery, building construction, animal husbandry and even stints in a fire watch tower. In 1957, she married Ernest Holder. Some years after his death, she married Edmund Durbin. From 1999 to 2002, Hazel Durbin recorded the stories that became her autobiography, A Quilted Life, co-authored with Vickie Cimprich (Contrary Beartrack Press, 2002). Vickie Cimprich is a Northern Kentucky writer. Her first poetry collection, Pretty Mother's Home: A Shakeress Daybook (Broadstone Books, 2007), was researched in Shaker journals at the Shaker Village of Pleasant Hill, Kentucky. Her work appears in The Journal of Kentucky Studies, Licking Valley Review, Poetry As Prayer: Appalachian Women Speak, and The Journal of Franciscan Colleges and Universities. She received a 2011 Artist Enrichment Grant from The Kentucky Foundation for Women. After I’d been in Kentucky about two years, I had to deliver two babies in Breathitt County. There were some midwives around, but they had no training. They were older ladies and the only thing they knew about it was they’d had children of their own, or they would have been with women having babies, but they didn’t know anything about when things went wrong. So this first time, they sent for the old midwife lady. She went out in the yard, she cut some weeds out of the yard, boiled them and gave the lady some tea to make her have her pains or whatever. I don’t know what they was doing. All kinds of old junk. I never would use herbs and things like that because I didn’t know how much to use, what they would do to a patient. But many of the old midwives went out and gathered in this and that and made tea and made the lady drink it and whatever. I don’t know. I was pretty upset about that because I didn’t think it was right. But the baby lived, the mother lived. They named the baby Hazel Lucinda. The man said, “I can’t say all of that. I’ll just call her Cindy.” I guess she grew up being just Cindy; they moved to Erie, Pennsylvania, and I’ve never seen them since then. I really didn’t know much, so I decided I better go back to California, get into hospital work of some kind and learn what to do for people. That year BIOLA — Bible Institute of Los Angeles — was offering a new course called Missionary Medicine. I got into that course. The training was six days a week, four hours every day. Then schoolwork five days a week, four hours of a morning. I had some good doctors in my training too, that gave me ideas that were not in the textbook. They knew I was coming back to the mountains and they passed on their information to me. At BIOLA there would have always been a doctor on hand. Although one time there, a doctor was at a party on a beach playing around. He didn’t like it that we called him to the hospital, but the lady was ready to deliver. We took her to the delivery room; there was a registered nurse with me that day. She was giving the patient some ether to slow down the pain. The doctor came in and spouted off what everyone was supposed to do. She set the ether can down, and he didn’t have time to put his rubber gloves on before the baby was born. When I came back in 1947, I hadn’t been in Lee County very long when we were building the Bible camp. The first load of lumbers that was taken up the hill for the camp was dumped off in a mixed up pile. I was stacking the green lumber which I knew would warp if it wasn’t stacked. Jeffrey Hatchet came after me to come and deliver a baby for his wife. I went down there and delivered a little boy. That boy died in 1997. He was fifty years old. I cut the obituary out of the paper. From then on, I delivered babies over at Cressmont when I lived there, and around Heidelberg and Yellow Rock when I was married and lived back here. Went on horseback when I had the horse, or then in a truck or car. Some doctors at BIOLA had taught me different things to do that I could help a mother. There’s a girl that lives out by Bible camp now, 47 years old. Her mother said her delivery with me was the easiest one she ever had. That was a funny one too. I had gone in the pickup truck from our store to get a load of coal. Miss Hannah, who used to be the police woman down in Beattyville, was a missionary at the Children's Home then. She started after me and we met on the Beattyville Hill as I was coming home with the load of coal. She told me what the score was, so I went on to the house. Sent Miss Hannah or the husband to get my kit from home. I delivered a little girl. I still call her my baby. I always made up some pads with newspapers to put under the patient. I made covers for the newspapers out of old sheets and things. The cloth part was always kept and laundered and re-sterilized again. I sterilized my kit in the old oven. The book that I had said if you put it in the oven and bake a baked potato at the same time, by that time your kit will be sterilized. So it takes about 30, 40 minutes in the oven to sterilize your kit. I had the pads, I had leggings, I had a draw sheet to put underneath the patient and one over the patient. The leggings were made out of muslin and were to cover up the legs. They folded down at the top, so all that was exposed of the patient was just what part you were working. For modesty more than anything else. That’s what I was taught when I was in school. I had some scissors, and forceps that I used for clamping the cord, material for tying the cord. A little ampoule of Ergotrate to help stop the bleeding and Pituitrate that would help with the pains — make the contractions stronger. I kept those with me in a little suitcase. I had a little hypodermic needle to give these when I needed to. The only other thing I had was some KY jelly. Some mothers were real noisy, would scream and holler, and that doesn’t do a bit of good. But I guess anybody would. To start with, when the baby was born I took my little clamps and clamped the cord twice. I cut it between the two clamps and later on tied the cord. Held the baby up by its heels to make sure it was going to breathe. I’d rub a dry towel up and down on the back. People talk about spanking the baby, but I never did. They told me at the hospital, some doctor did, just rub them up and down the back and they’ll cry quicker. When they’d cry, then I’d take ’em up. That’s the most beautiful cry you ever heard. Your nerves are all on edge, I’ll tell you. Sometimes the mothers and fathers would cry; I never did. The last one I delivered must be getting close to thirty years old now. I wrapped the baby and put it beside the mother or across her stomach, beside the bed or on the bed. After I got the mother taken care of, I gave the baby a bath. I always kept a big bottle of baby oil to bathe them in; that’s what I was taught at the hospital. Put a band on it. Now they don’t use bands anymore. My obstetric doctor at school said he always kept his mothers in bed for ten days. By the time they get old enough to go through the change of life, they will thank you for it. Now they let them up before they turn around twice. I lost one baby, full term I’m sure. I’d tried to get her to go to the hospital that night, but she wanted an old fashioned delivery. It was a long, long delivery time. When the baby come, I never could get him to breathe. I lost another baby. The lady’s husband went for a doctor when I couldn’t deliver the afterbirth. The doctor came, but I was so angry with him. He had lost his license in some other state where he had worked. He was here in Lee County doing things he shouldn’t have been. When he delivered that afterbirth, he never put on a pair of rubber gloves, he never washed his hands. I was so angry to think that a doctor would act like that with a patient. She got along all right. I delivered another baby where there was Rh factor, but they didn’t tell me about that. The baby only lived a few days. If it had been in the hospital it probably would have lived. Once, a child seemed to be coming face first and I know they can’t be born that way, and I had to put my hand in and eventually tip the head down a little bit so it could come out. That’s unusual. I delivered one set of twins. Two little girls. Actually one of them got there before I did, but I delivered the next one. I don’t think there was ever any premature babies I delivered here in the mountains. I delivered one that weighed about 12 pounds. A great big baby. I didn’t know if I was going to be able to save the baby and the mother too or not. There was no way of getting her out or getting a doctor in. Just had to wait it out. Her husband was in the penitentiary; she was living with another man. I made him come in and help me a little bit. That was one of the hardest ones I ever delivered. In the hospital she might have had a cesarean or the doctors might have did an episiotomy. I couldn’t do that. Sometimes they would tear, but I still couldn’t do anything about that. I didn’t have that training. I’ve called the doctor several times when I was out on a delivery and having trouble. Sometimes the doctor came and helped me; sometimes he told me I should take them to the hospital. And sometimes I was in places where I couldn’t get to a hospital. But doctors have always gone along with me for the things that I’ve done in Kentucky. How to wait on mothers that had a difficult time. I really didn’t have anything to help with the pain. I would just tell them to breathe deeply. Husbands usually would help. I would often have the husband come in and hold their hands, so they could have something to pull on. Sometimes I’d put a sheet around the bottom of the bed so they could hang on with both hands to pull. Dr. Sam Johns came to me one time when I was having a difficult time delivering a baby. The mother’s bones just were not cooperating to let the baby come out. He was impressed how I treated my mothers — the way I had the bed fixed for them, sterilized pads and sheets, leggings to help them feel more comfortable and secure. “Don’t leave me, don’t leave me, don’t leave me,” she said. So I delivered the baby and I wore my rubber gloves. But she had never been to the doctor, never had a blood test — which is something I always had to do after I delivered a baby where the mother hadn’t had a blood test. This was because of syphilis and gonorrhea and things like that. I never came across much sexually transmitted disease, but I’d been trained about it. I never lost a mother. Once in a while I would see women before the delivery but as far as doing any examination, I never did. I don’t especially remember any would ask any questions. It’s a scary time to get way down in one of these hollers or up on one of these mountaintops and you’ve got mama and baby both in your hands and no doctor within reach. But with God’s help I delivered a lot of babies. The last baby I delivered was about 1964. After that, somebody came after me to come and deliver twins, but I didn’t go that time. It was too far; they were closer to doctors and hospitals and I talked them into getting somebody else. We had better roads; people were moving out of the hollers up onto the roads where they could get in and out better. People began to have automobiles and be able to go to doctors. All told, I delivered around 65 or 70 babies around the counties: some in Lee County, some in Owsley County, two in Breathitt County. Some of the untrained midwives welcomed my work; some of them didn’t. Is it OK for women not to bear children? I think so. I think it’s wrong to get rid of them like they do nowadays, but if they don’t have them for some reason, I don’t see anything wrong in that. I don’t think everybody understands. I don’t think everybody does.